Four fish from Aliwal Shoal - did you identify them correctly? 1) The paperfish, Taenianotus triacanthus Lacepède, 1802. displays a variety of colours: tan, purple, yellow, dark brown or reddish. 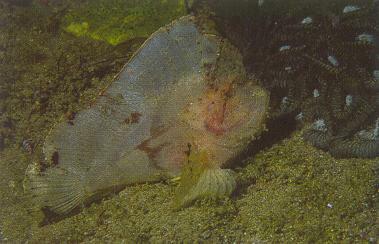 Often seen sitting (rocking back and forth) on sandy bottom or coral reefs. 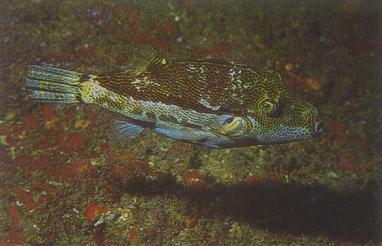 Indo-Central Pacific species extending south to Aliwal Shoal. Attains 10 cm. 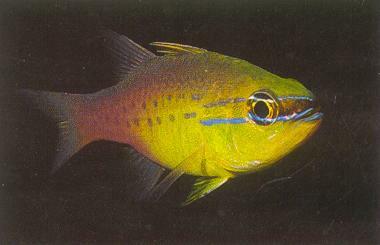 2) The short-tooth cardinal, Apogon apogonoides (Bleeker, 1856) is an Indo-West Pacific cardinalfish extending south in our area at least to Aliwal Shoal. The species name apogonides is apparently a misspelling. Attains 10+ cm. 3) Unlike the gilded triggerfish, Xanthichthys auromarginatus, (Bennett, 1831) which is also known from Aliwal Shoal, the striped triggerfish, Xanthicthys lineopunctatus (Hollard, 1852) does not exhibit sexual dichromatism. 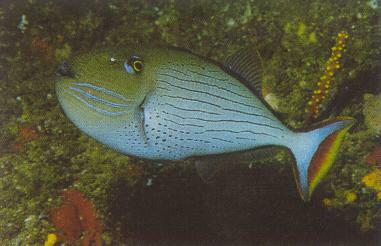 The striped triggerfish is known only from South Africa, Rèunion, Mauritius, northwest coast of Australia, Japan (Ryukyu Islands), and the Bonin Islands. 4) The doubleline toby, Canthigaster rivulata (Temminck & Schlegel, 1850) which attains 20 cm, is the largest species of the genus. Indo-Pacific species extending south to Algoa Bay.